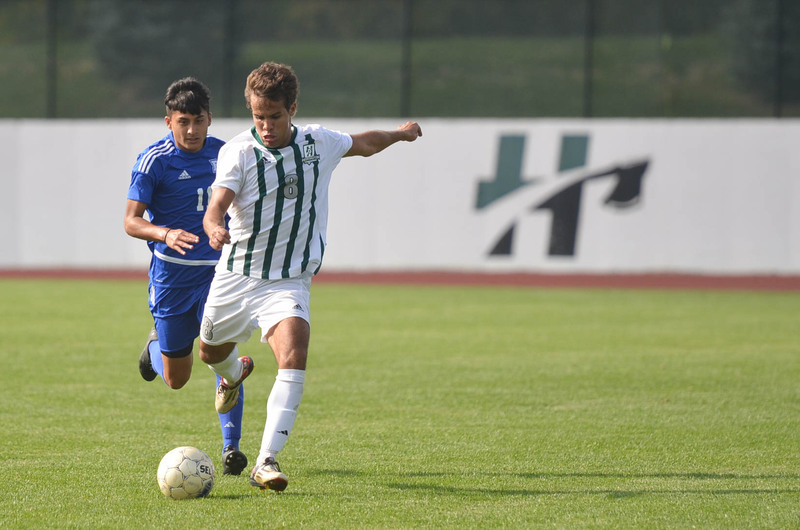 The Huntington men’s soccer team was successful in completing one of their early season goals of playing a conference tournament game at home. The Foresters were able to pull out a 1-0 victory thanks to a late double-overtime goal from freshman forward Bradey Gerke in a game that was a treat for players and fans alike from start to finish.. The Forester faithful knew how big this game was, and they filled the bleachers. Constant chants and cheers came from each bleacher seat, and students pounded drums. The game was a true back-and-forth battle with the Foresters outshooting the visiting Maple Leafs 17-11, including 6-1 through both overtime periods. When regulation ended, coach Lawson said his team remained focused. Gerke’s golden goal came in the 107th minute on a rebound shot off the preceding corner kick. Up next was the conference’s number one seed, Bethel. The preparation for the upcoming game was very intense and focused. The Foresters played an even game with Bethel and kept pushing their attack until their game plan proved successful. In the 13th minute, senior midfielder Marcos Salinas brought the ball up the sideline and crossed it to sophomore forward Matheus Louzada standing on the back post. Louzada headed it to Miguel de Sousa, who flicked the ball into the back of the net. The goal stunned the Bethel crowd and amplified the rowdy traveling Huntington fans. The Foresters were one step closer to the chance at the conference championship. The second half proved to be a much more defensive half for Huntington, with the Pilots outshooting the Foresters 16-0. The equalizing goal came in the 87th minute after consecutive quality opportunities by Bethel. Sophomore defender Travis Rippe says the morale didn’t falter after the goal. Neither team took an advantage during both overtime periods. The penalty shoot-out didn’t end in the Foresters’ favor, as they were beat 4-2. Huntington ended with a record of 8-9-2 and the best conference finish the program has seen in 25 years. The Foresters are looking to maintain the work ethic and success they had this season through the off-season.